I Love You More Than Carrots: Finally, A Monthly Box For Moms. By now I'm sure you're aware of the myriad of monthly mail subscription box services that exist out there. I myself am subscribed to two different services, both of which cater to my children. 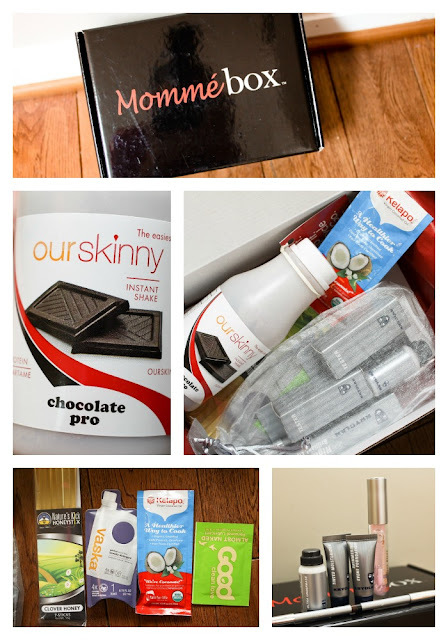 When I came across Momme'box, a monthly subscription box geared towards spoiling me, the mom, I couldn't wait to see what they had to offer. Not only do I love getting mail but I especially love getting SURPRISE mail. The minute this shiny little black box landed on my doorstep I couldn't wait to tear into and see what was inside. 7. $15.00 coupon good towards any purchase at Mineral Hygienics. If you're keeping tabs, that's roughly $74.00 worth of products for a one month subscription price of $20. Not a bad deal, if you ask me. And the products? Were pretty awesome. If you'd rather subscribe monthly, at a minimum of four months, the price per month for a single box is $15. The protein shake was the first item I decided to test out. Word to the wise? Use cold water. Don't use room temperature water. Trust me on that. After I added a couple ice cubes, it was a delicious (and filling) treat. Quite chocolate-y. Although I wasn't familiar with many of the brands, after testing the products, I can say that I was quite pleased with most of them. As disappointed as I'm sure you are to hear, I have not tried the personal lubricant (yet) or the laundry detergent but I use the Honeystix in my tea at night and have used the coconut oil on my hair before a shower. I was mostly impressed with the makeup products that were included in this box, particularly the full-size items. Most importantly, however, I love how this box is designed especially for moms. It's nice every once in a while to receive something in the mail just for me that isn't a bill or children's party invitation. Click here to subscribe to Momme'box. Want to enter for a chance to win one month's subscription for free? Enter below using the Rafflecopter widget. Giveaway open to US Residents only, ends Monday February 11th at 11:59pm. I did not receive financial compensation for this post. I did receive product free of charge in exchange for my honest opinion which was expressed above. I didn't realize how affordable the boxes are! I might just pamper myself with one or ask for a subscription for my next birthday or holiday. Ohhh, or maybe for Valentine's Day! Um, yes please! That looks awesome. I'd love a monthly mom box. It would include copious amounts of wine, chocolate anything and 3 hours of peace and quiet. Just ordered 1 mom box for myself to try. Where do you get the kid boxes from , I had looked at citrus lane but never tried them . What a great idea! I love this, and would probably get a little too excited to check the mail everyday! A box all for me? What a treat!